The following table lists the recommended hardware requirements for the Management Node and Conferencing Node (Proxying Edge Nodes and Transcoding Conferencing Nodes) host servers. We recommend Intel Xeon Scalable Processors (Skylake) Gold 61xx generation or E5-2600 v3/v4 Haswell/Broadwell architecture from 2014 or later. Also works with Xeon E5-2600 v1/v2 processors (Sandy Bridge/Ivy Bridge from 2012 or later). 2 GB RAM per physical core (if using hyperthreading and NUMA affinity to deploy 2 vCPUs per core). Hardware allocation The host server must not be over-committed in terms of either RAM or CPU. In other words, the Management Node and Conferencing Nodes each must have dedicated access to their own RAM and CPU cores. SSDs are not a requirement, but general VM processes such as snapshots and backups will be faster with SSDs. GPU No specific hardware cards or GPUs are required. Network Gigabit Ethernet connectivity from the host server. Operating System The Pexip Infinity VMs are delivered as VM images (.ova etc.) to be run directly on the hypervisor. No OS should be installed. * This does not include the processor and RAM requirements of the hypervisor. ** Support for ESXi 4.1 is being deprecated. † Sufficient for deployments of up to 30 Conferencing Nodes. For larger deployments, you will need to increase the amount of RAM and number of cores. For guidance on Management Node sizing, consult your Pexip authorized support representative or your Pexip Solution Architect. ‡ For VMware platforms, ESXi 6.x is required to make full use of the AVX2 instruction set. Note that AVX or AVX2 is required; older instruction sets are not supported. †† The servers hosting Proxying Edge Nodes do not require as high a specification as those servers hosting Transcoding Conferencing Nodes. This is because proxying nodes are not as processor intensive as transcoding nodes. The minimum functional CPU instruction set for a proxying node is AVX, which was first available in the Sandy Bridge generation. You still need multiple proxying nodes for resilience and capacity. We recommend allocating 4 vCPU and 4 GB RAM (which must both be dedicated resource) to each Proxying Edge Node, with a maximum of 8 vCPU and 8 GB RAM for large deployments. The number of calls (or ports) that can be achieved per server in a Pexip Infinity deployment will depend on a number of things including the specifications of the particular server and the bandwidth of each call. For more information, see Capacity planning. When deployed on our recommended hardware (Intel Haswell, 10 cores, 2.3 GHz), Pexip Infinity can connect up to two High Definition 720p30 calls per CPU core. This is based on 1.1 GHz per HD call plus 20% headroom. Capacity for higher speeds can be linearly calculated based on these figures. The same recommended hardware can connect a higher number of lower-resolution calls per CPU core. For example, up to 20 audio-only AAC-LD calls at 64 kbps. Servers that are older, have slower processors, or have fewer CPUs, will have a lower overall capacity. Newer servers with faster processors will have a greater capacity. Use of NUMA affinity and hyperthreading will also significantly increase capacity. The type of processors and Hypervisors used in your deployment will impact the levels of performance you can achieve. Some known performance considerations are described below. As from software version 11, Pexip Infinity can make full use of the AVX2 instruction set provided by modern Intel processors. This increases the performance of video encoding and decoding. For VMware platforms, ESXi 6.x is required to enable this optimization. We have observed during internal testing that use of AMD processors results in a reduction of capacity (measured by ports per core) of around 40% when compared to an identically configured Intel platform. This is because current AMD processors do not execute advanced instruction sets at the same speed as Intel processors. AMD processors older than 2012 may not perform sufficiently and are not recommended for use with the Pexip Infinity platform. We have observed during internal testing that use of VMware's ESXi 4.1 hypervisor may result in a reduction of performance of approximately 20% (as measured in number of ports per physical core allocated to the Conferencing Node) when compared to VMware ESXi 5.x. This is due to slower pass through execution of advanced processor instruction sets. Memory must be distributed on the different memory channels (i.e. 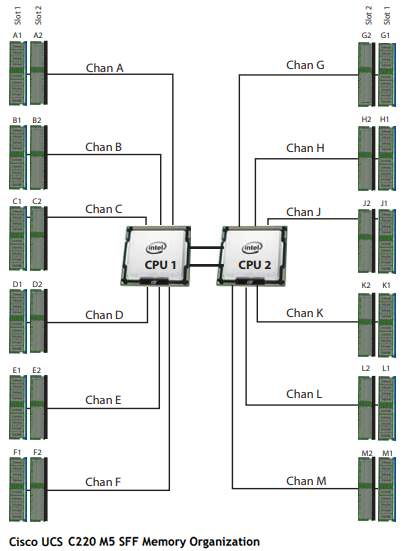 4 channels per socket on the Xeon E5-2600; 6 channels per socket on the Xeon Gold 61xx series). There must be an equal amount of memory per socket, and all sockets must have all memory channels populated (you do not need to populate all slots in a channel, one DIMM per channel is sufficient). Do not, for example, use two large DIMMs rather than four lower-capacity DIMMs - using only two per socket will result in half the memory bandwidth, since the memory interface is designed to read up from four DIMMs at the same time in parallel. Therefore for a dual socket E5-2600 you need 8 identical memory DIMMs. Therefore for a dual socket Gold 61xx you need 12 or 24 identical memory DIMMs.